Book buys were minimal over December and perhaps it’s too early to post about January buys but since I’m on a roll with this scheduled post thingy, here we are. Simon’s Cat is the comic book of the YouTube sensation of the same name. I could have just stood in the book store and finished it several times over, so I don’t know why I sank RM55 into getting it. Uhm, but I went through it 5 times already. 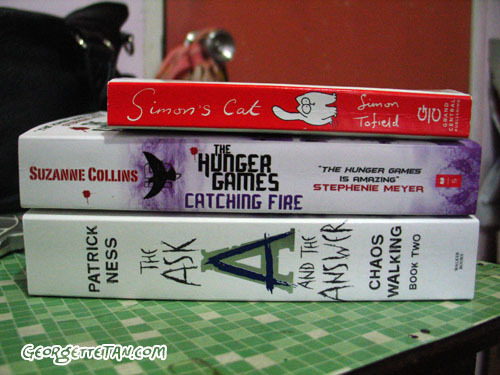 The other two books are sequels that I decided to follow. The Hunger Games cost me a night of sleep because I made the mistake of picking it up at 3am. It only makes me wanna reread both books again now. I think I might just read the first book of Chaos Walking before starting on the new one. It was a difficult but rewarding book to read, but I don’t really remember the details now.